When you have a bit of the blues and need something flaky with a custard filling or with chocolate and almonds, head over to this place. The croissants are quite good, a personal favorite is the chocolate almond croissant. Or if you are feeling more continental order an espresso and an opera. 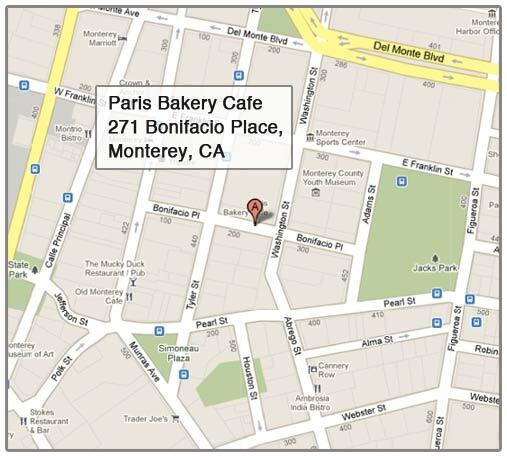 Paris Bakery is located in beautiful downtown Monterey, California, just steps from the Monterey Bay, Cannery Row, and other world-class attractions. 6:00 am - 6:00 pm, Monday through Saturday. 6:30 am - 4:30 pm. Sunday. 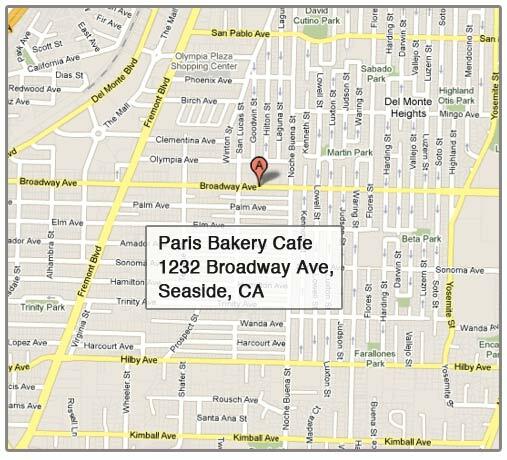 A wholesale/retail store, catering primarily to the wholesale market, is located in Seaside, California, at 1232 Broadway Avenue. 7:00 am 3:00 pm, Monday through Friday. 7:00 am - 1:00 pm, Saturday and Sunday.